India's inaugural Premier League (IPL) season got off to a flamboyant start with an opening ceremony watched by millions across the globe. In a flurry of rhetoric, the inaugural season was billed as a revolutionary event for world cricket. The chairman of the Board of Control for Cricket in India (BCCI), Sharad Pawar, claimed it represented an "opportunity for the world’s senior players to teach the new young players which will build a strong future team for India". "The world is watching what is happening in Bangalore," he said ahead of the opening game. "In 44 days, 123 Indian players and 73 overseas players are going to play 59 matches in eight different places." The opening ceremony saw acrobats, singers and a troupe of cheerleaders from Washington Redskins perform for the world's media and a sell-out crowd of 55,000 at Bangalore's M Chinnaswammy Stadium. All eight of the IPL's team captain were also present at the ceremony. Despite the hype the opening ceremony was largely boycotted by the world’s media, with a number of agencies having failed to reach an agreement with the league’s governing body and boycotting coverage. The seemingly-never-ending IPL tournament has ended, albeit with lot of brouhaha during the closing ceremony and a fantastic final match (by some quirky turn of fate, every IPL tournament’s final is a very close contest – IPL World Cup final, ICL final and now this!) – it is time we take stock of how different sets of people would react to the end of what has been the most exciting tournament in a long long time. Men in India: For one and half months, they were not short of entertainment between 8PM-11PM. On some days, there were two matches on the same day. It was ‘more the merrier’ for this particular set of people. They used to come back from work/colege, take some rest and watch the entire match till they dozed off to sleep. Getting used to T20 cricket is like getting used to marijuana – the more you have, the more you want. From today, these men would have no entertainment, nothing to look forward to at night. Their evenings would once again turn into a dull-drab affair. They would begin to ask questions about how unfair the tournament was, in that it ended only after one and half months. As with all other issues in life, they would lament themselves in the men-only group at work/college. Women in India: This set is the most excited of all that this tournament has finally ended. 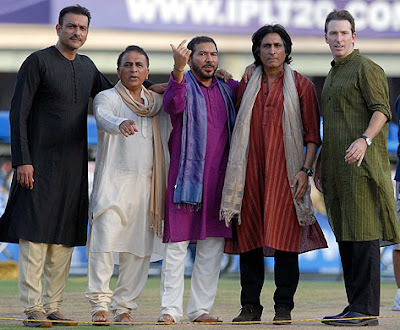 They were the biggest opposition of IPL since it was slotted in prime-time and hence not allowing women to watch their serials – serials which usually continue for approximately 4 years with infinite number of saas and bahus, 257 relatives and 100 children, all in a gigantic house where almost every other day there is a festival/death. Women had to bear the brunt of cricket being discussed all day all night at home – driving them close to insanity. How could they miss their daily dose of tears from Tulsi and evil shenanigans from various other stupid bahuraanis? Alas, they found out at the end of IPL that producers of these serials did not take the story forward by much during the past one and half month (as they did for the past one and half years) – they rub their hands in glee at the prospect of watching all serials all night till another cricket tournament takes over. Desis in the US: IPL was a topic of much elation, with heated arguments and discussions – taking place during the most productive hours at work – from 1030 to 1330. Battlelines were drawn between states and the respective teams. Completion of deadlines was secondary to discussing the latest goofup in team selections or the brilliance of a new strategy. Each one pitched in with their own theories and best practices in T20 cricket, unmindful of the frenzied atmosphere of NCAA/NBA championships around in the US. Weekends were a breeze – with two matches on every day of the weekend (and with benevolent softwares like Sopcast and TVUplayer), it was one big party for one and half month. Politicians: (Yes, they are usually neither Men nor Women!) Last heard they were bickering about reservations in the IPL teams. Karunanidhi was especially upset that Chennai Super Kings lost to an unknown desert team Rajasthan Royals, and decided to take up the matter with the unMan-mohan singh, calling in for reservations and progress of the Tamizh state. Vasundhara Raje for her part has declared that Royals win has been a befitting reply to the wily terrorists who dare to blow bombs in Jaipur to cause impact to maximum number of people. Rahul Gandhi has called for a greater cohesion in the Congress party much like Rajasthan Royals and Chennai Super kings but not like Deccan Chargers and Bangalore Royal Challengers. Prathibha tai (in case you forgot, she is our Honorable President) has decided to talk with ghosts and spirits to help Delhi Daredevils win next time. As the IPL drew to a close, much like the primaries in the US – President Bush sat smiling in the White House watching IPL and the primaries on two different television sets asking himself, ‘Now, how and where should I seek fun? Maybe I will bomb another country before November’ and proceeded to call his Generals to the White house! News to next generation youths! All of them know that future of any country depends on youths. But no one is ready to give capital money before they get appreciable outcome. But there are some online groups, ready to give first cash advance after filling there simple online forum. They also provide facility to get payday loan, mixing this with your work, everyday will be your payday. My friend Jeeva is very crazy about cars. Last week he bought new one. When i asked him for a trip to nearest hill station, not only he refused and also said he was just yesterday applied for auto car insurance and got the letter soon after that only we can go any where! He continued that the one he applied was online basic.I was surprised and asked him how is it possible?he told me about online insurance .I really enjoyed what he told to me. Friends i think that information surely more useful to you all.